To be put simply, sending a greeting card simply means you care. It's that simple. Further, developing a custom card of your own, no matter what the occasion may be, and whether you are an individual, small business or corporation, sharing a custom card sends an immediate and powerful message of consideration and integrity of the sender who went to the trouble. As most anyone reading this knows, the aviation community in this country is a vast, yet tight-knit group representing some of the most passionate, creative and resourceful people living on the planet today. We all in aviation have a great many things to share, honor, be thankful for and care about. When done properly, a custom aviation card not only extends a simple invitation for an event, expression of sentiment, or marketing message, a great card can quickly become a keepsake to many, being hung up and posted on the walls of hangars, FBO's and offices throughout the world for many years to come. An incredible achievement for such a small investment by any measure. Developing an outstanding custom aviation card of your own can, and will, always be a thoughtful and long lived reminder of "aviation's true spirit." When a special occasion arises, don't give it another thought, Airmail Greetings makes the process of developing a custom card a simple and painless one. When you are ready, we would be honored to help you in creating a little aviation magic for you to share with the world. Please contact us at Joe@Airmail-Greetings.com or use the form on our Contact page. This 2007 holiday card example was created for Lonnie Hilkemeier, Master CFI, and President of Specialty Flight Training Inc. in Boulder, CO. The original full-blown 3-D model of the P-38 logo was carefully developed by Joe Jones, in trade for his Private Pilot and Instrument rating. For all that dream of flight, where there's a will there's a way. Created from the beginning as a 3-D model, the flight school's signature P-38 logo was then simply brought in and adapted to incorporate a beautiful winter theme landscape, and also features the Boulder Flatirons in the background. To say the least, Lonnie was thrilled. As a profound comment to the success of Lonnie's efforts in creating a custom aviation greeting card for his students and client base, we have already received calls from individuals solely to order his new 2007 holiday card for themselves. 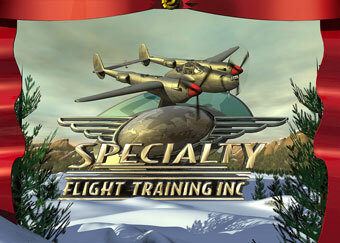 Something that is just fine to Specialty Flight Training Inc.